Home / Bypass MIUI 9 Google Account /FRP Lock All Xiaomi /Redmi Android Nougat V7.1.2/ 2018 -3-1 Patch. 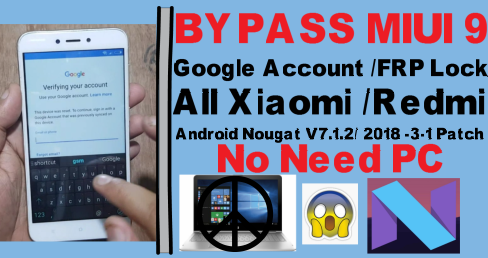 / videos / Bypass MIUI 9 Google Account /FRP Lock All Xiaomi /Redmi Android Nougat V7.1.2/ 2018 -3-1 Patch. Bypass MIUI 9 Google Account /FRP Lock All Xiaomi /Redmi Android Nougat V7.1.2/ 2018 -3-1 Patch. Bypass MIUI 9 Google Account /FRP Lock Required File. Bypass MIUI 9 Google Account /FRP Lock Method. 2# Open talkback ( Tab 2 Finger On Screen 10 sec ). 4# Click volume up and down now disable talkback. 11# Download Quick Short CutMaker Apk.(www.gsm-solution.com). 14# Serch setting and open it. 15# Go to about phone and click 4 time miui namber. 16# Now enable developer option. 17# Go to oem unlock click 2 time then enable talkback. 18# Now rebot your phone.you can used to ready phone. 19# Your frp lock remove complite.